The Japanese waka poet Kakinomoto no Hitomaro belongs to the world of the seventh century and the very early eighth century, prior to perishing from this world. His legacy remains in the vestiges of Japanese high culture because he belongs to the Thirty-six Poetry Immortals. This reality is based on Hitomaro being extremely prominent in volumes 1 and 2 of the richly credited Man’yōshū. 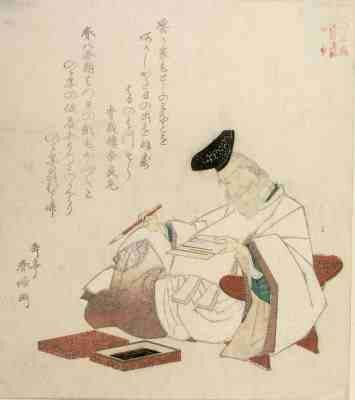 Therefore, Hitomaro, who belongs to a Japan heavily influenced by the Asuka Period, had space to focus on his artistic talents. 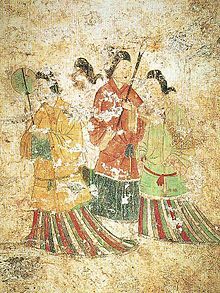 Hitomaro belonged to a revolutionary period because Buddhism developed and prospered in Japan after arriving from the Middle Kingdom (China) and ancient Korea during the Asuka Period. 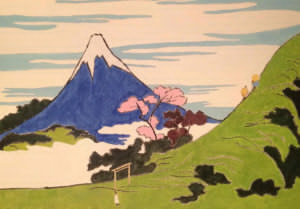 Similarly, the artistic soul of Japan was growing in complexity and one can only imagine how Hitomaro welcomed this reality (second and fourth art image by Sawako Utsumi). At the same time, political and social changes began to witness a new era. Hitomaro focused on long poems called chōka and short poems titled tanka. His long poems express his passion and deep thinking on certain issues – and sometimes a lament. This isn’t to underplay his tanka because he was also widely respected in this area. Yet, it seems that his chōka enabled him to reach a higher plain but this is open to each individual who reads the poetry of this esteemed poet. In modern Japan, people can pay respects to Hitomaro by visiting two Shinto shrines that acknowledge his birth and death. 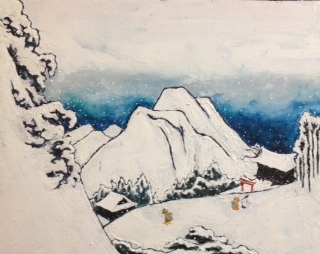 The simplicity of these two Shinto shrines – and the richness of nature – can be fused with the poetry of Hitomaro and how like the endless seasons his poetry still preserves.